Justices Weigh Rights Of 'Deadbeat' Parents The case before the court Wednesday comes from South Carolina, where Michael Turner was jailed for a year for failing to pay child support. He argues that he couldn't afford to pay, and that sending indigent parents to jail without providing them with a lawyer is a modern form of debtors' prison. The Supreme Court on Wednesday will hear a case testing whether indigent parents facing jail time for failing to pay child support have the right to a lawyer. Go to any shelter for homeless families, and you likely will find children who would not be there but for their fathers' failure to pay child support. Spend a day in family court, and you likely will see indigent fathers, with no lawyer, being taken away in handcuffs because they could not pay the child support they owed. So-called deadbeat parents, usually dads, have long been a conundrum for the law. On Wednesday, they are the U.S. Supreme Court's legal problem. Jailed For Being Too Poor? The justices are hearing a case testing whether indigent parents who fail to make child support payments may be jailed for as much as a year at a time, without the state providing a lawyer. Though most states provide counsel for those too poor to afford legal help, a minority of states do not, including Florida, Georgia, Maine and South Carolina. The case before the justices comes from South Carolina, where Michael Turner, an indigent father, was jailed for a year for failing to pay child support. He could have gotten out of jail earlier by paying the nearly $6,000 he owed, but with no money and no job, he could not make the payment. He served the full 12 months. The jail sentence was neither the first nor the last that Turner served for failure to pay. Because the mother of his child received welfare for a period of time, she assigned her right to child support to the state. The case then became subject to automatic enforcement procedures, sending Turner to court whenever he was in arrears. Michael Turner V. Rebecca Rogers Et Al. Michael Turner of South Carolina was sentenced to one year in jail for failing to pay child support. Because he couldn't afford to pay the nearly $6,000 he owed, he served the entire sentence. Turner appealed to the state Supreme Court, which ruled against him, saying he had the ability to secure his release from prison as soon as he paid what he owed. The Sixth Amendment establishes the rights of the accused in criminal prosecutions, stating, among other things, that a defendant has the right to counsel. In this case, the question before the court is whether a long jail term for civil contempt amounts to criminal punishment. South Carolina is among a minority of states that don't provide counsel for indigent parents facing prison. Turner argues that because of the possibility of a jail sentence, the state should have provided him with a lawyer. He argues that sending him to jail is a modern form of debtors' prison. The state and the mother of Turner's child argue that no lawyer is required in cases like these because the proceedings usually turn on simple factual issues of payment history. Also, they argue, introducing lawyers into the proceedings would disadvantage mothers who can't afford a private attorney to help them seek child support payments. Because he was repeatedly behind in payments, he was repeatedly sent to jail. Indeed, he was in jail again as recently as January. Since South Carolina is one of those states that does not provide a lawyer for indigent parents facing prison for nonpayment, Turner was on his own in court. The judge, without making a factual finding of Turner's ability to pay, ordered the maximum sentence. The lawyers who now represent Turner pro bono in the U.S. Supreme Court contend that he was jailed, in effect, for being too poor. They say that in South Carolina and other jurisdictions like it, the system that sends deadbeat dads to jail without a lawyer is a modern form of debtors' prison. Rebecca Rogers, the mother of Turner's child, and the state of South Carolina maintain that there is no need for a lawyer in these cases, because court proceedings usually turn on simple factual issues of payment history. The South Carolina Supreme Court agreed, finding that the nonpaying parent "hold[s] the keys to his cell" because he can secure his release as soon as he pays. Rogers says introducing lawyers into these proceedings would disadvantage mothers who, like her, often cannot afford a private attorney to help them seek the child support payments they are due. She maintains that fathers often willfully avoid paying even when they can afford it, and points out that during one period of time, Turner bought drugs for himself instead of paying what he owed. Rogers says the only threat that has produced any money from Turner is the prospect of jail, noting that on four occasions he paid hundreds of dollars — still far short of the thousands he owes — in an effort to avoid jail. Both sides cite the research of Elaine Sorensen, a senior fellow at the Urban Institute and co-author of the article "Deadbeats and Turnips in Child Support Reform." "Deadbeats," according to Sorensen, are parents who could pay but choose not to. "Turnips" — invoking the phrase, "You can't get blood out of a turnip" — are parents who don't have the money to pay. So what percentage of nonpaying parents are deadbeats and what percentage are turnips? Sorenson says most of those who end up in jail are low-income, and thus, "more likely to be a turnip than a deadbeat." The central legal issue in this case is whether and in what circumstances the state may deprive an individual of his liberty without providing him a lawyer. The Supreme Court has long held that those facing criminal charges, including criminal contempt of court, are entitled to a lawyer. The Constitution provides that in all criminal prosecutions, the accused shall have the right to assistance of counsel. But deadbeat parents are cited for civil, not criminal, contempt of court. So the question before the court Wednesday will be whether long jail terms for civil contempt amount to criminal punishment. Turner's ex says "no." She and the state argue that families have an interest in simple, swift and informal procedures so that fathers cannot flout their obligations and leave their children destitute. Turner and his supporters counter that appearing in this kind of proceeding without a lawyer is like climbing a mountain without legs — it can be done, but not easily. They point to statistics showing that, in South Carolina, 13 percent of the county jail population consists of nonpaying parents held in civil contempt, and 98 percent of them did not have lawyers. Are Juveniles Entitled To 'Miranda' Warnings At School? 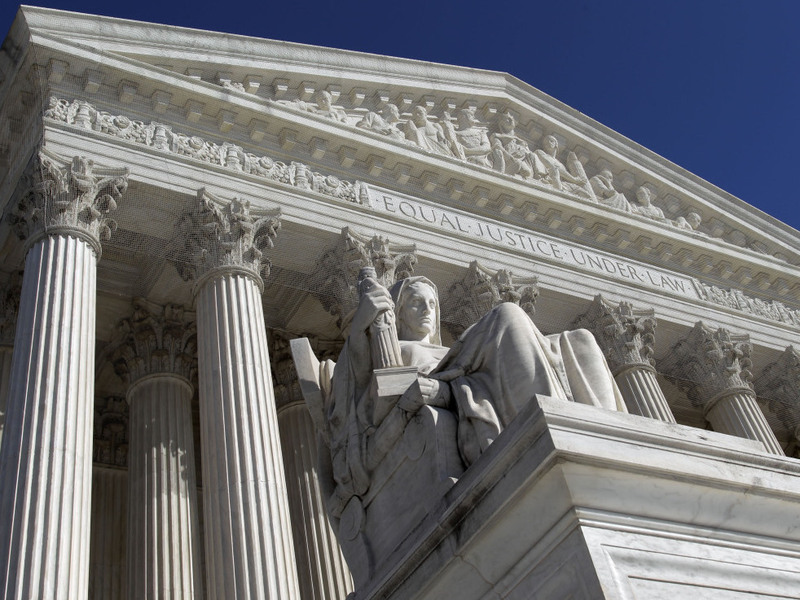 The Supreme Court hears another case involving children on Wednesday. At issue is whether police are required to advise children of their rights when interrogations are conducted in school. A 13-year-old special education student in North Carolina was pulled out of class by police, escorted to a conference room, and questioned about a string of neighborhood burglaries. A 13-year-old special education student, known as J.D.B., was pulled out of class by police, escorted to a conference room, and questioned about a string of neighborhood burglaries. The boy's parents were never contacted, and the boy was never given a Miranda warning. After questioning by police, the boy confessed to the crimes. He now wants his confession suppressed because he was never read his rights. The question before the court is whether police are required to advise children of their rights when interrogations are conducted in school. North Carolina defends the police officers' actions, arguing that Miranda warnings are only required when a suspect is "in custody" — either a formal arrest or a restraint on the suspect's freedom of movement. Lawyers for J.D.B. argue that courts should consider age as a factor in determining whether a suspect is "in custody," because a child's age could render him "particularly susceptible to the coercive techniques of police interrogation." The boy's parents were never contacted, and the boy was never given a Miranda warning — the warnings routinely given by police to criminal suspects upon arrest to inform them of their constitutional rights. A policeman questioned the boy, identified as J.D.B, for 30 to 45 minutes in the presence of another officer, the school's vice principal and an administrative intern. The other officer held up a digital camera that the investigator said was stolen from one of the homes, and the vice principal told the boy to "do the right thing." When J.D.B asked if he would "still be in trouble" if he "got the stuff back," the police investigator responded that the case would go to court, but that giving back stolen items "would help." The police officer also told J.D.B that he would get a court order to put him in juvenile detention if he believed that the boy would continue breaking into homes. The policeman then informed J.D.B that he did not have to speak with him and that he could get up and leave, but he added that he hoped the boy would stay and listen to what he had to say. The boy eventually confessed to the crimes. He now seeks to have his confession suppressed because he was never read his Miranda rights. North Carolina defends the police officers' actions, arguing that Miranda warnings are only required when a suspect is "in custody" — either a formal arrest or a restraint on the suspect's freedom of movement. And the state notes that the police told the boy he was free to go. Police should not have to consider a suspect's age or special education status, the state contends. Lawyers for the boy disagree. They say that age is one of the factors courts should consider in determining whether a suspect is "in custody" for purposes of the Miranda warnings because a child's age could render him "particularly susceptible to the coercive techniques of police interrogation." A decision in this case is also expected by summer. The audio and a previous Web version of this story incorrectly stated that Ohio is among states that do not provide legal counsel for poor defendants in child support contempt proceedings. We relied on information in a U.S. Supreme Court brief, but it turns out that while the Ohio Supreme Court ruled there is no constitutional right to counsel, the state has since enacted a law providing counsel.